Charged With a Crime ? Injured in an Accident ? Involved in a Business Dispute ? Curtis is a top notch lawyer ... he is calm, clear, and thorough. At the law firm of Fallgatter Catlin & Varon, P.A., Jacksonville criminal defense attorneys and personal injury lawyers have more than eight decades of combined experience. Our firm consists of distinguished, respected attorneys working with a dedicated staff to create a formidable legal team of skilled negotiators and aggressive litigators. Two of our partners are natives of Jacksonville, and the partners have strong ties to the local community. Our previous experience as opposing counsel and as a federal prosecutor gives us a distinct advantage in our current practice. We use our insight regarding what the other side is likely to do to develop effective Jacksonville criminal defense. Our goal is to get your criminal charges dropped before the prosecution files them. Regardless of whether you are charged with a white-collar crime, DUI or traffic violations, or any other misdemeanor or felony offense, an experienced lawyer from our firm in Jacksonville can protect your rights throughout the legal process. At the Jacksonville personal injury law firm of Fallgatter Catlin & Varon, P.A., our lawyers have a strong commitment to helping our clients recover full and fair compensation for injuries because of the negligent acts of others. Even if your own actions contribute to an accident, Florida statutes still permit you to pursue compensation from other negligent parties based on their degree of liability. Because we know what the insurance defense attorneys are thinking, our personal injury lawyers in Jacksonville have a strategic edge in litigating for maximum recovery in personal injury claims. Have you or someone you know been arrested for a DUI? 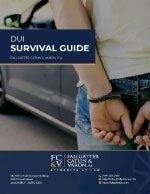 Download our Free DUI Survival Guide Today!